Makey Makey is a device that uses conductivity to make anything trigger a button on your computer. With this device, Bylta developed a system using the conductive properties of metal, the human body, and the semiconductive properties of glass - when over about 1200° glass transforms from an insulator to a conductive material! With loads of wiring, circuits are completed in the Makey Makey when activated by performers working with molten glass in myriad ways. Inspired by traditional tap shoes, Bylta invented sneakers with metal plates on the soles, that connect to wiring which is affixed on the performer's ankle. When a performer steps across metal pads in the hotshop, these shoes allow the microcurrent to travel from the pads through the performer's body to the punty with molten glass, the Benchtrument, or the Maypole, to complete circuits in the Makey Makey using human conductivity. The metal Floor Pads are connected to the Makey Makey with a system of wire cords. 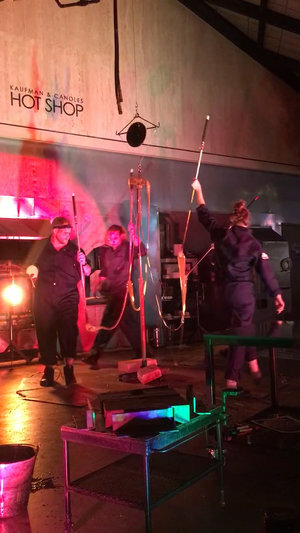 As the performers walk across the different pads connected with canes of molten glass between them, circuits are completed and trigger a unique real time composition. Bylta has various sets of Floor Pads that connect performers to Sculptural Instruments in different ways. The Benchtrument is a custom-made instrument by Bylta for the glassblower´s bench, and has been part of all of Bylta´s shows. It triggers sounds through the turning of the punty or the blowpipe, and can also be played with fingers, much like a keyboard. The Maypole is Bylta's newest Sculptural Instrument. When performers attach canes to the center hub of cast glass, another performer raises the telescoping central pole via a hoist system. Performers then circle around the pole on conductive tracks, creating a soundscape as the molten glass ribbons braid around the pole.